And I worked on Charlotte Clayton a little bit. I have the outline of the orange kitty stitched. 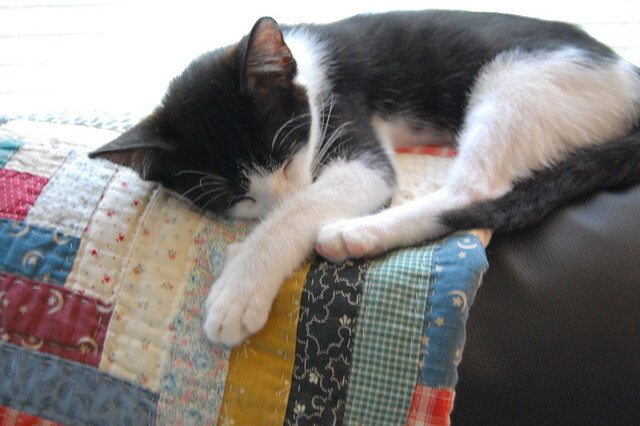 Speaking of kitties, I have to share a picture of Oreo, She was sleeping on a quilt my mom made years and years ago (all by hand). Love the Christmas garden :) I think the colours are just gorgeous! And Oreo looks sooooo content. Pets are just a joy aren't they! Great WIPs, and Oreo (what a gorgeous name!) is really sweet. 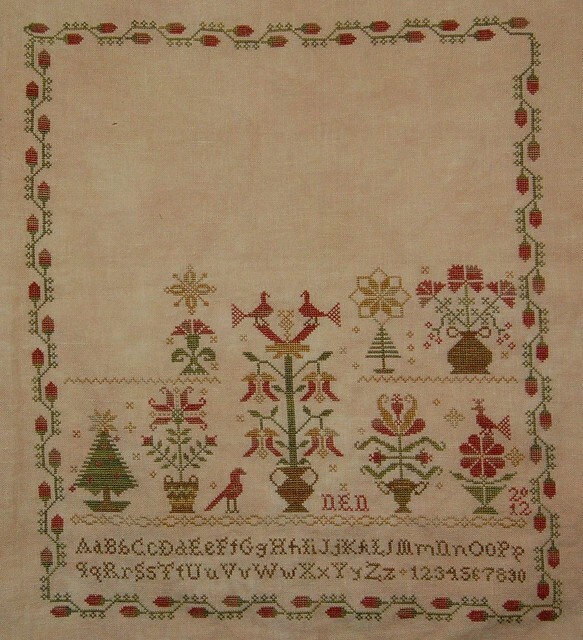 I love Christmas Garden -- really need to join you in stitching it. Beautiful so far! And Oreo -- she is such a sweetie!! Sweet kitty!!!! Love both projects, the colors are gorgeous. Both those projects are great. I love both the fabrics that you're using. And I love, love the name Oreo. She is so cute!! I really like Christmas Garden, very pretty. So how much are the kids loving Oreo :) So cute! Your Christmas Garden looks wonderful and you've got a great start on Charlotte. Oreo is adorable. Christmas Garden is beautiful! Oreo is such a cutie. Super schöne Arbeiten, and a nice cat. CG is so pretty. But I must resist...too many WIPs and not enough finishes in my stitching basket :( maybe someday! Oreo certainly knows how to pick a napping spot...nice comfy quilt made with love by "grandma"...who doesn't love that! Wonderful cats. Oreo is such a cutie. And Charlotte's cat ia almost as beautiful as little Oreo. Love your version of Christmas Garden. Nicole - your Christmas Garden looks great. I so love that alphabet on the bottom. Oreo ... what a cute name and darling kitten. Will add so much joy to your family!!! Can't wait to meet you at PALS. Your Christmas Garden is beautiful. The kitten is adorable. Very pretty stitching, but oh, I love that cute Oreo! She's so sweet in that photo. I love seeing Oreo on your blog now! Beautiful WIPs! I love your Charlotte Clayton especially! Gorgeous stitching! Oreo is a total cutie! Beautiful progress Nicole. I love Christmas Garden. Whenever I get around to it, I'll do the alpha at the end, too. Yours is beautiful - happy you didn't change the red? Oreo is adorable! Are you totally in love yet? You are making great progress on your projects. Oreo is just way too cute. Lovely progress on Christmas Garden!! What a sweet little kitty sleeping. She looks so comfy there! 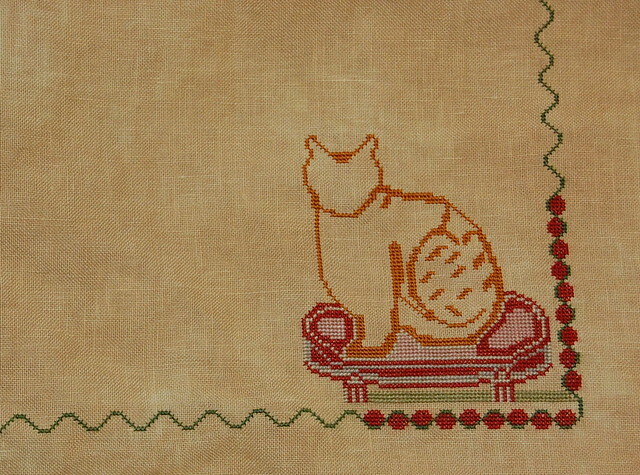 Very pretty sampler...Even prettier little kitten, love the name! Christmas Garden is coming along great. I wish I was that far along. I think I will do the alphabet, too. Kitties and quilts make super fun photos, don't they? So sweet. chrismtas garden is so pretty! Your Christmas Garden is looking lovely! Such a sweet kitty!!! Love the name! That is one lucky kitten to find your home. I love it(girl or boy) also. I have always loved cats now I have a black cat with 3 white patches on the belly. His name is Shadow when he was small he followed us always. Now has a mind of his own.